حقیقی, فرشیدرضا, عباسی, شهرام. (1396). ساخت مدل تصمیم به عبور دانش‌آموزان از عرض جاده‌های برون‌شهری. پژوهشنامه حمل و نقل, 14(2), 263-274. فرشیدرضا حقیقی; شهرام عباسی. "ساخت مدل تصمیم به عبور دانش‌آموزان از عرض جاده‌های برون‌شهری". پژوهشنامه حمل و نقل, 14, 2, 1396, 263-274. حقیقی, فرشیدرضا, عباسی, شهرام. (1396). 'ساخت مدل تصمیم به عبور دانش‌آموزان از عرض جاده‌های برون‌شهری', پژوهشنامه حمل و نقل, 14(2), pp. 263-274. حقیقی, فرشیدرضا, عباسی, شهرام. ساخت مدل تصمیم به عبور دانش‌آموزان از عرض جاده‌های برون‌شهری. 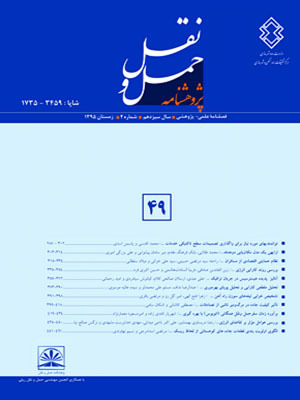 پژوهشنامه حمل و نقل, 1396; 14(2): 263-274. یکی از بخش های بسیار مهم مهندسی ترافیک مسئله‌ی عابرین پیاده است. به علت ویژگی‌های معمول شخصیتی، انتظار رفتار غیرمحتاطانه از عابرین نوجوان دور از ذهن نیست. همچنین در کشور ایران تعداد بسیار زیادی از مراکز تحصیلی و آموزشی که اساساً مورد استفاده‌ی نوجوانان قرار می‌گیرند در حاشیه‌ی راه‌های برون‌شهری واقع هستند و تردد عابرین پیاده‌ در کنار چنین موسساتی مکرراً مشاهده می‌گردد.بررسی اندرکنش عابرین با وسایل نقلیه و جریان ترافیک در این نواحی می‌تواند در راستای بهبود ایمنی و تسهیلات عابرین نتایج مفیدی را ارائه کند. در این پژوهش دانش‌آموزان به عنوان یکی از آسیب ‏پذیرترین قشرهای عابرین پیاده در جاده‌های برون‌شهری مورد بررسی قرار گرفتند و داده‌ها از فیلم ویدئویی ضبط شده از محل عبور دانش‌ آموزان 3 مدرسه، در جاده‌ای برون شهری واقع در شهرستان محمودآباد استان مازندران، طی سه روز کاری هفته استخراج گردید. سپس احتمال عبور عابرین از عرض خیابان با استفاده از نرم افزارspss و مدل رگرسیون لجستیک مورد بررسی قرار گرفت.نتایج نشان داد که متغیرهای زمان انتظار قبل از عبور، فاصله وسیله نقلیه خط دور و مقدار سرفاصله بر احتمال عبور عابرین از عرض جاده تاثیر بسزایی دارند. همچنین در بین متغیرهای تاثیر‌گذار مقدار سرفاصله بیشترین تاثیر را در احتمال عبور عابرین داشته است. 2M.Sc., Grad., Department of Civil Engineering, Babol Noshirvani University of Technology, Iran. One of the very important issue of pedestrian traffic engineering is. Due to the typical characteristics of personality, reckless behavior expected of young pedestrians not far-fetched. In Iran, a large number of educational centers are located mainly used by teenagers are located on the periphery of suburban roads and pedestrian traffic is frequently seen with this type of institution. Study the interaction of vehicle and pedestrian flow these areas can improve traffic safety and pedestrian facilities to provide useful results. In this study, students as one of the most vulnerable pedestrians in suburban roads were analyzed and recorded video data from the past 3 school students in suburban road in the city of Mahmudabad, Mazandaran province, the three working days of the week were collected. The possibility of pedestrians crossing the street width using SPSS software and logistic regression were used. The results showed that the waiting time before passing away vehicle and the amount of headway on the possibility of crossing the line pedestrians across the road are very effective. Among the factors influencing the amount of headway had the greatest impact on the probability of passing pedestrians. - حبیب‌پور، ک.، صفری، ر.، ­(1391)،"راهنمای جامع کاربرد SPSS در تحقیقات پیمایشی، متفکران، تهران. - نصیری، ح.، ساجد عموقین، ی. (1381)، "بررسی و شناسایی عوامل موثر بر تصادف عابرین پیاده در ایران و مدلسازی رفتار آن‌ها به هنگام عبور از عرض خیابان، پایان‌نامه کارشناسی ارشد، دانشگاه صنعتی شریف. - Arman, M. A., Rafe, A. and Kretz, T. (2014), “Pedestrian Gap Acceptance Behavior, A Case Study: Tehran”, Conference: Annual Meeting of the Transportation Research Board, At Washington DC, Vol., 94. - Bedeley, R.T., Attoh-Okine, N.O. and Lee, E.R. (2011), “Modeling pedestrian crossing behavior using Bayesian networks, Proceedings of the Institution of Civil Engineers- transport”, Volume 166, Issue TR5, ISSN: 0965-092X. - Clifton, K. J. and Fults, K.)2007), “An examination of the environmental attributes associated with pedestrian–vehicular crashes near public schools”, Accident Analysis and Prevention, Volume 39, Issue 4, pp. 708–715. - Khatoon, M., Tiwari, G. and Chatterjee, N. (2013), Modelling of pedestrian unsafe road crossing behavior: A comparison at a signalized and a non-3 signalized crosswalk, In TRB 92nd Annual Meeting (No. 13-4086). - OECD/ECMT (2006), Transport research center. Speed management report. Paris. - Pawar, D. and Patil, G. (2015) Pedestrian temporal and spatial gap acceptance at mid-block street crossing in developing world, Journal of Safety Research, Volume 52, pp. 39–46. - Sun, D., Ukkusuri, S.V.S.K., Benekohal, R. F. and Waller, S. T. (2003), Modeling of Motorist-Pedestrian Interaction at Uncontrolled Mid-block Crosswalks, 82nd Annual Transportation Research Board Meeting. - Yannis,G. Papadimitriou, E. and Theofilatos, A. (2013), Pedestrian gap acceptance for mid-block street crossing. Transportation Planning and Technology, Vol. 36, No. 5, pp.450-462.